The most famous annual concert worldwide is the New Year’s Concert. This performance of the Philharmonic features the celebrated dance music – mainly waltzes and polkas – of the Strauss family. 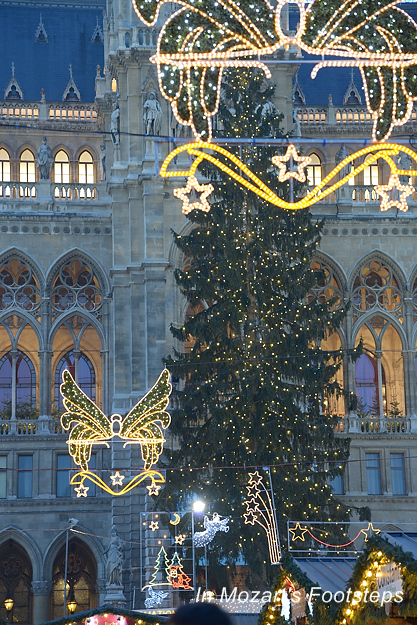 It is now broadcast around the globe and has come to showcase Vienna to an international television audience. 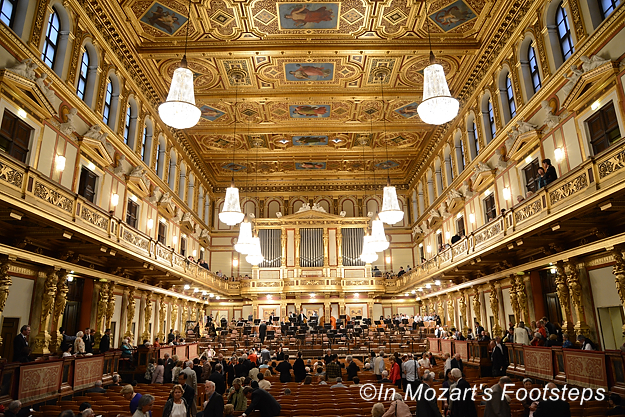 The Great Hall of the Musikverein in Vienna. The first time Johann Strauss Jr. directed the Philharmonic was on April 22, 1873 for the Vienna Opera Ball, then held in the Musikverein. Strauss wrote Wiener Blut for the occasion. The master of the waltz only conducted the orchestra a few times, the last of which turned out to be tragic. He guest conducted the Overture to Die Fledermaus at the Court Opera on May 22, 1899, and caught a cold which turned into pneumonia and took his life less than two weeks later. For all its popularity today, Strauss’s music was rarely played by the orchestra at the beginning of the twentieth century. 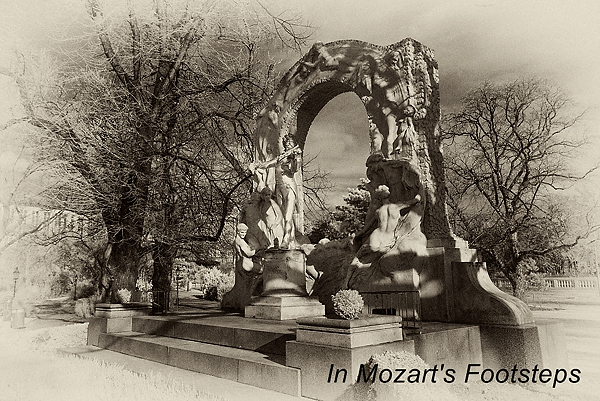 Things began to change in 1921, when Arthur Nikisch conducted three waltzes to coincide with dedication of the famous statue in the Stadtpark. Then in 1925, to celebrate the hundredth anniversary of Strauss’s birth, Felix Weingartner conducted An der schönen blauen Donau (On the Beautiful Blue Danube) at two subscription concerts and also led an all- Strauss concert. The golden statue of the “Waltz King,” Johann Strauss, Jr. in Vienna’s Stadtpark. From 1929 to 1933, Clemens Krauss led an annual series of concerts of music by the Strauss family. In what has become the New Year’s Concert, Krauss conducted a “Special Concert” on December 31, 1939. The next year the concert was moved to January 1 with a repeat performance the following day. Finally, the name “New Year’s Concert” was used in 1946, and, except for two years, Krauss led these performances until his death in 1954. After much debate and discussion, the orchestra chose Willi Boskovsky to take over these concerts. Boskovsky led the New Year’s concerts for 25 years. For many, these were the golden years of these concerts. Boskovsky was the concertmaster of the Philharmonic and directed the orchestra just as Strauss himself had done – with violin in hand. He also had a charming personality that helped make these concerts into charmingly nostalgic excursions into Vienna’s past. 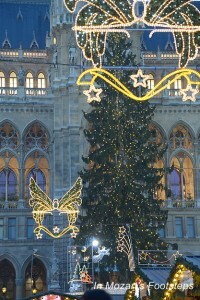 The Christmas Market at Vienna’s Rathaus (City Hall). It was during Boskovsky’s tenure that the concert was first broadcast live on television, turning what had been a local concert into a worldwide media event. Following the Boskovsky years, Lorin Maazel was chosen to direct the concerts, which he did through 1986. Since 1987, a different renowned conductor has been invited to direct each year. There are now three concerts: the Preview Performance on December 30, the New Year’s Eve Concert, and the New Year’s Day Concert. As might be expected, tickets for these concerts year have become highly prized. Up to a few years ago, a letter requesting tickets had to arrive in the Philharmonic’s office on January 2, not before or after. Today, requests are made via the Internet, and the period for applications for next year’s concerts is from January 2 to February 29. The “winners” are then chosen at random. When you attend a concert by an orchestra, the musicians on stage are usually the focal point. The Greensboro Symphony’s first concert of this season gives us that and more as members of the Greensboro Ballet join to create a memorable evening of music and dance. Fittingly, the concert is entitled “Invitation to the Dance” and is part of our city’s 17 Days Festival. Opening the concert will be Carl Maria von Weber’s well-known work, “Invitation to the Dance.” This music tells the story of a male suitor’s invitation to a woman to dance with him. In the introduction, one can actually hear the dialogue between the pursuing male and the reluctant female. She finally accepts his offer, and the rest of the piece is a glorious waltz. Members of the ballet will be on stage to bring this interplay to life. Hector Berlioz’s “Hungarian March” follows, and this is taken from his opera “The Damnation of Faust.” The aging Faust hears this music being played by a military band comprised of soldiers who are enthusiastic about becoming war heroes. A very different opera gives us the next composition. Camille Saint-Säens’s “Samson and Delila” relays a story from the Old Testament. As Samson prepares to enter the temple, priests perform a savage dance, the Bacchanale. Saint-Säens’s music portrays the strength of the priests’ convictions, but Samson refuses to give in to his enemies and pulls down the columns of the temple, killing himself and his adversaries. The Greensboro Ballet will assist in telling this story. Let’s just hope War Memorial Auditorium is intact afterwards! There are several pieces of classical music that are instantaneously recognizable to virtually everyone, although many people don’t even know their titles. Khachaturian’s “Sabre Dance” is one of those pieces. Even if that name is not familiar to you, the music will be. I remember hearing it as a kid as the music that accompanied a performer who was trying to spin multiple plates on top of sticks at the same time. Maybe that will help you know the music or maybe not. Somehow I doubt that the ballet’s choreography will represent these spinning plates! Another instantly recognizable piece is Alexander Borodin’s “Polovtsian Dances.” Originally music from his opera “Prince Igor,” this music has been used in countless ways. Perhaps the most famous adaptation of Borodin’s melody was as “Stranger in Paradise” from the 1953 musical “Kismet.” It has also been arranged from everything from early jazz to hip hop. This melodious tune will be enhanced by members of the ballet. Continuing with music that made its home on Broadway is Leonard Bernstein’s “West Side Story.” This is Shakespeare’s “Romeo and Juliet” set in New York City in the 1950s, and the Montagues and the Capulets have been replaced with rival street gangs, the Sharks and the Jets. Bernstein’s score is known for catchy melodies, tender love songs, and rhythmic dances. The orchestra will perform the Symphonic Suite, which contains the best-known themes. Closing the program will be another waltz. Maruice Ravel wrote his “La Valse” in 1906 as a tribute to the music of Johann Strauss, Jr., the great Viennese waltz master and composer of “On the Beautiful Blue Danube.” Ravel sets his waltz in an ingenious way. It begins as if in a distant fog, almost as if in a dream, and it gradually becomes clearer and clearer. Accompanied by the ballet dancers, this will be a great way to end the first program of the year. This article appeared in Greensboro, North Carolina’s News & Record on September 29, 2013. The Concerts are on October 3 & 5, 2014. In Part 4 of this series, we learned about the growth of the festival starting in 1925, and the changes brought about during the Nazi years. In Part 5, we learn about superstar conductors and further changes that brought the festival to where it is today. Following the war, the event became a Festival once again. In the rebuilding process, several new directions were important to the organizers. More performances of contemporary music and opera were desired, opera productions unique to Salzburg (and not just imports from Vienna) should take place, and recapturing a true Mozart style was envisioned. Wilhelm Furtwängler was the dominant conductor and Karl Böhm also conducted to great reviews. But the productions of newer operas failed to draw a large public. Berg’s Wozzeck, von Einem’s Der Prozess, and Barber’s Vanessa were just three operas that did not sell many tickets. 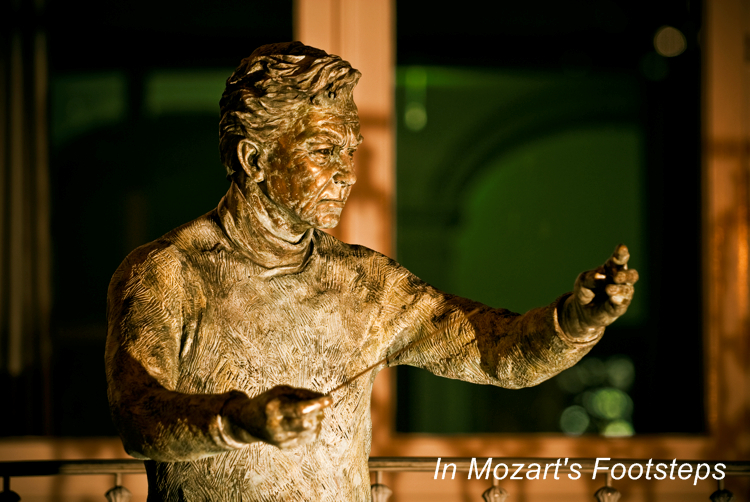 When Furtwängler died in 1954, Herbert von Karajan was ready to take leadership of the festival. He was not only a podium star – at times being the director of six important positions at once – but was also a great impresario and visionary. The Salzburg native realized that times had changed and that audiences were more sophisticated. He conducted first rate operatic performances with stellar casts and interesting productions. He also proposed an ingenious plan of having four of the five important Mozart operas in the repertoire at all times, with each having a new production every five years. Karajan also began to invite international orchestras, starting with “his” Berlin Philharmonic, to perform. The audience reaction, not to mention the effect of ticket sales, was extremely positive. Statue of Karajan next to the Makart Bridge. He was born in Salzburg in 1908. Karajan made the festival his own. He demanded total control over the operatic casts and all conductors for both operas and concerts. The maestro also greatly restricted the amount of contemporary music at the festival which caused higher percentages of tickets to be sold, but caught the ire of many critics who called the programming too conservative. Perhaps the largest development (literally) of the Karajan era was the construction of the new Festival Hall. Its immense proportions made it only suitable for grand opera and large orchestral concerts, the music Karajan wanted to conduct. Much like his control over choosing the performers, he would only let others conduct opera in the new hall with his permission. As stated in an obituary after his death in 1989, Karajan was “the last absolutist ruler”. 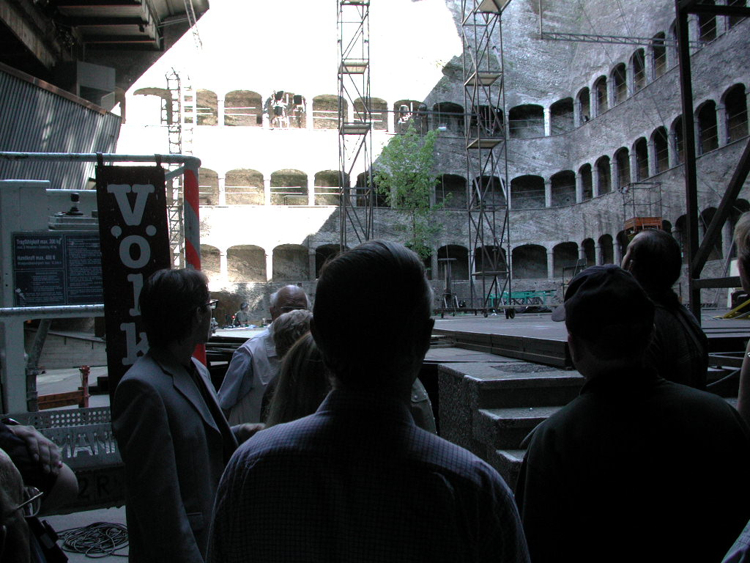 A huge change occurred in the Salzburg Festival when Gerald Mortier took over in 1990. He declared that “A New Salzburg” had begun, one that encouraged more contemporary music, provocative productions, and a younger audience. New stage directors, such as Peter Sellars and Robert Wilson, found Salzburg ready to accept their new ideas in operatic design. 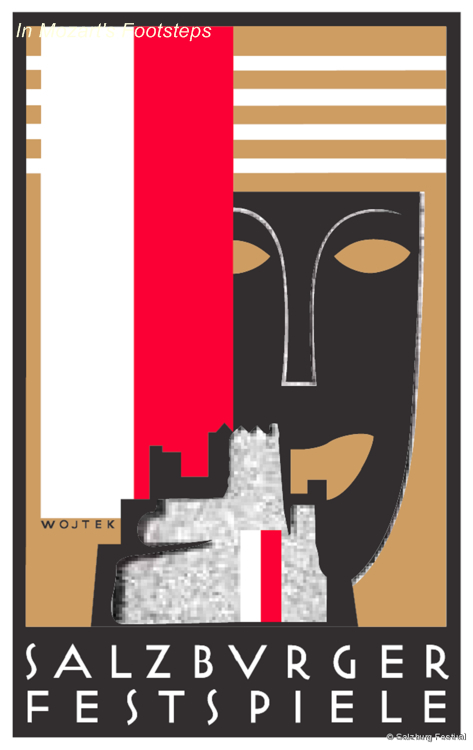 Operas by Janácek, Messiaen, and Ligeti were performed alongside of Mozart. He was the right person to break out of what some had considered the stagnation of the festival during the last years of Karajan. Peter Ruzicka took over in 2002 and immediately started looking to 2006, the 250th anniversary of Mozart’s birth. The massive undertaking of staging all 22 of the master’s operas in the anniversary year was a huge success. These years also saw many world premieres, honored Richard Strauss for his role in founding the festival, and featured works by the lesser-known Austrian composers Korngold, Zemlinsky, and Schreker. Since that time, the festival has continued to grow and thrive. For the music lover, attending the festival is a treat not to be missed. 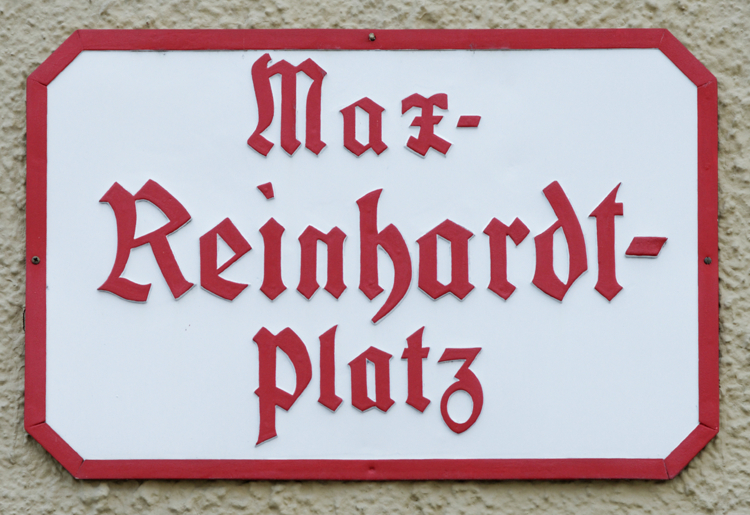 In Part 2 of this series, we learned the role of Max Reinhardt in getting the festival started. In Part 3, we will see how the festival was not an immediate success. Even after Reinhardt started the festival, it still took a while before it was established as a successful endeavor. The 1921 festival featured Jedermann, as it had in 1920, and also a handful of chamber music and orchestral concerts conducted by Bernhard Paumgartner with members of the Mozarteum Orchestra supplemented by several musicians from the Vienna Philharmonic. The repertoire was to include Mozart’s Don Giovanni and Cosi fan tutte, as well as music by Strauss, but was changed because of poor financial planning. Strauss was not pleased and threatened to resign. In 1922, the fledgling festival continued to grow and featured four Mozart operas with star-studded casts. Strauss and Schalk conducted these performances at the Landestheater. Jedermann was not produced, as Reinhardt staged The Great World Theater, a Spanish play, at the Collegiate Church instead. Underlying these festivals were great political struggles within its organizers and between Salzburg and the government leaders in Vienna. The Viennese politicians were not quick to fund supply the funding the organizers had requested. The clientele for the performances also had not been what Reinhardt and Hofmannsthal had hoped. Their image was of a festival that many local Salzburgers would attend, but the necessary high cost of tickets brought a socially elite audience in from out of town. Many store owners raised their prices and this further distanced the locals from the festival. 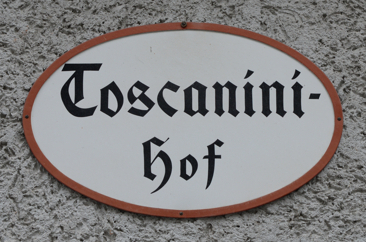 Hofmannsthal even returned a large share of the profits to the town, but still the locals were not satisfied. What looked like a positive step when the new hall at Hellbrunn was begun turned sour when the strains of post-war inflation curtailed progress on its building, and the funding to renovate the old Winter Riding School into a performance venue fell through. Count Alexander von Thurn und Taxis resigned as president of the Festival Society, and Richard Strauss agreed to take the position. The great composer and conductor would only serve a president for two years, and the strains of the position caused him to announce that he would not even attend the 1923 festival. Things became even worse when he and Schalk decided to take the Vienna State Opera (and thus the Vienna Philharmonic) on tour to South America, and then the Berlin Philharmonic refused to come to Salzburg because of the bad acoustics of the halls. The final blow was when the local government refused to give significant monetary support. Still, the 1923 festival took place and was remarkably successful. Members of the Vienna Philharmonic who were not on tour performed in Salzburg. But it was Reinhardt’s creativity that saved the day and kept spirits up. He staged Moliere’s Le Malade imaginaire and invited high-society guests to a rehearsal in his Leopoldskron home. As the fashionable attendees arrived, there were greeted with a total surprise: a comedian welcomed them with hilarious merry making. Helping guarantee that the important celebrities in attendance has a grand time was a lavish buffet with drinks! As 1924 festival was being planned, a conservative Salzburg newspaper, Der Eiserne Besen, began printing strongly anti-Semitic articles against Reinhardt and Von Hofmannsthal. The great director had planned on staging another play in the Collegiate Church, and had even received the Archbishop’s permission to do so. The newspaper gloated when the lead actress became ill and the performances were cancelled. Compounding was that the society did not have the money to hire the Vienna Philharmonic, and there were even rumors that the Viennese members of the festival’s Society had dug up the cornerstone at Hellbrunn. These rumors were false, but important people, including Strauss and Gehmacher, started resigning from the society. The damage had been done, and there was no festival in 1924. 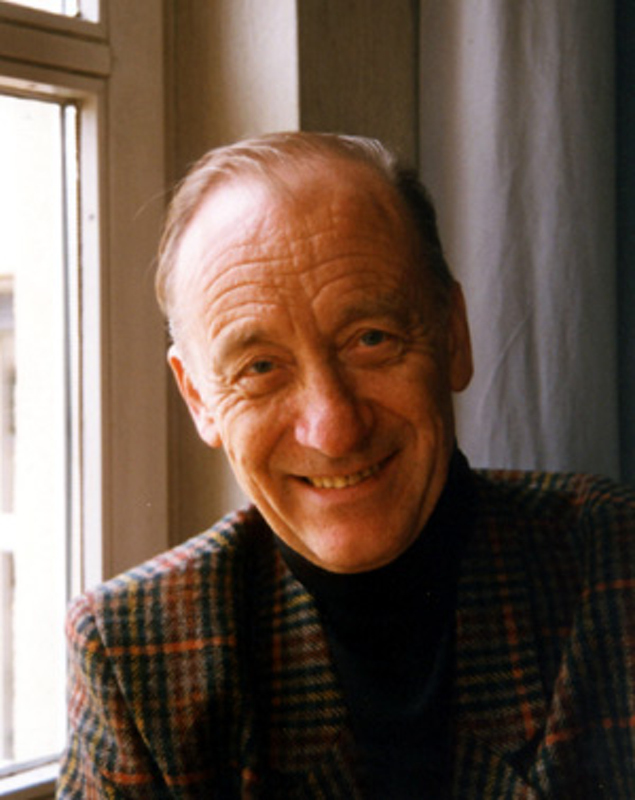 In Part 4 of this series, we will read how one man, Franz Rehrl, had the skills, and political acumen, to take the festival to a new level. 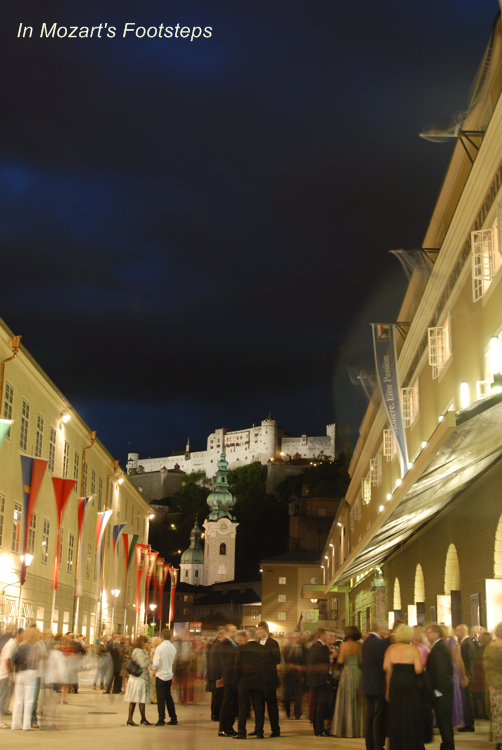 In Part 1 of this series, we saw how there were several unsuccessful attempts to start a festival in Salzburg. In Part 2, we will learn about Max Reinhardt, and how he finally succeeded in getting the festival off the ground. The Salzburg Festival Hall Society was started in 1917 with the desire of establishing a venue for performances of the festival that was in early planning stages. 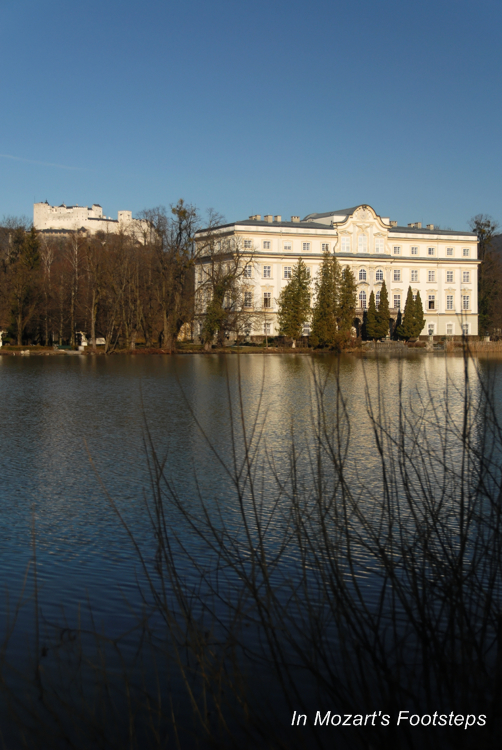 But at the same time, Max Reinhardt moved to Salzburg, buying and then renovating Schloss Leopoldskron to be his home. The theater director wanted to start his own festival, and felt that summer was the best time to bring visitors to the city and experience the beauty of Salzburg. 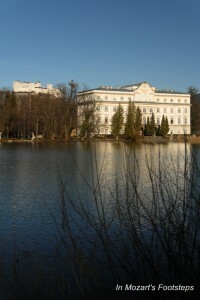 Reinhardt contacted the Imperial Theater in Vienna and suggested that they erect a new theater away from the activity of the Salzburg on the grounds of Hellbrunn Palace. He also wanted there to be a smaller hall for German Singspiele. To be part of the plans for this new festival, Reinhardt called on two former colleagues and collaborators: playwright and librettist Hugo von Hofmannsthal and composer Richard Strauss. The three leaders had already had interwoven artistic experiences: Reinhardt had directed works of Hofmannsthal in Berlin, Hofmannsthal wrote the libretto for Strauss’s Der Rosenkavalier, and Strauss’s inspiration to compose Salome came from attending Reinhardt’s production of the play. Hofmannsthal wrote eloquently about how the new festival would restore the status of the Austria of Maria Theresa’s time, even after the collapse of the Austro-Hungarian Empire. This would be done through music and theater, because “in Austria, art is life” as Hofmannsthal wrote. And Salzburg would be its center. The plans to build a theater at Hellbrunn were resurrected, but Reinhardt did not want to wait for the new building to be constructed. His first idea was to produce a modern setting of nativity play in a Salzburg church in December 1919, but poor weather and travel conditions forced this to be cancelled. Then he proposed staging Hofmannsthal’s version of Jedermann the following summer when the weather would be better. A few years earlier, Reinhardt’s production of Jedermann play in Berlin was a great success. The summer production was to be in the Felsenreitschule, but Reinhardt changed his mind to hold it in front of the Cathedral, a very important decision for the future of the festival. Jedermann was performed on August 22, 1920. Some of the audience sat on hard wooden benches, and others stood, some far enough away to hardly hear a word of what was happening on the outdoor stage. It was an overcast day, and legend has it that the sun came out in the middle of the performance, almost as if it were in the script. The production was repeated a week later exclusively for citizens of Salzburg. 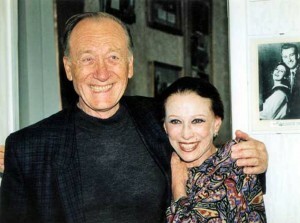 The first Salzburg Festival was two performances of Jedermann. The operas and concerts would come later. In Part 3 of this series, we will learn about the first years of the festival, and how it was not an immediate success. 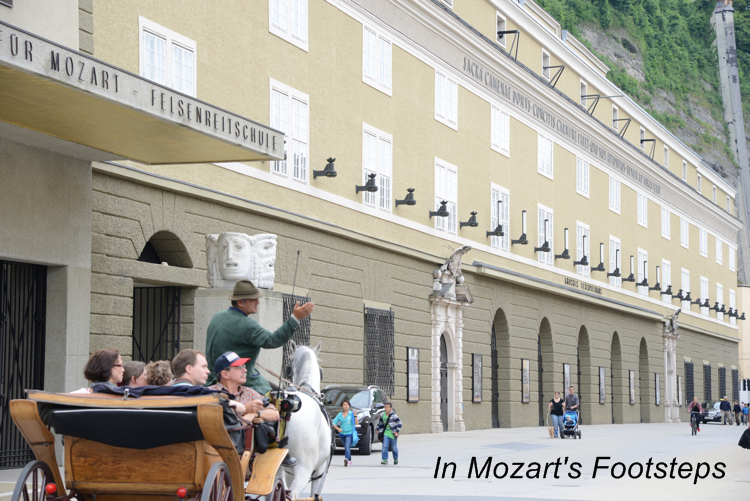 The Salzburg Festival is one of the pre-eminent annual music festivals in the world. For about six week each summer, the finest conductors, singers, instrumentalists, orchestras, and actors make Salzburg their home as they present wonderful performances. Here is a series of five short articles that tell the story of how this festival came to be. 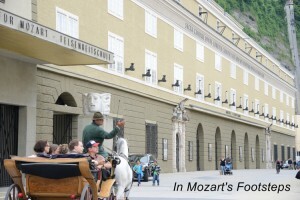 The idea for a festival in Salzburg started in the 1800’s. 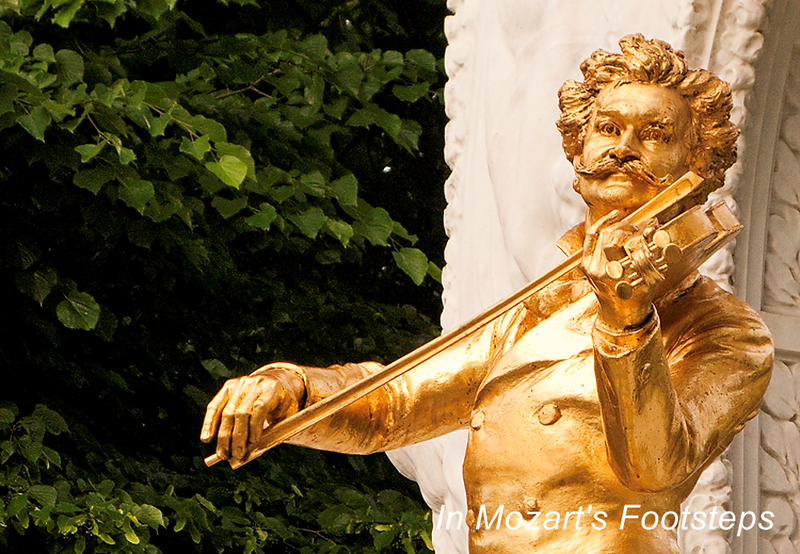 Starting in 1876, the annual Bayreuth Festival performed Richard Wagner’s operas, and many people felt that Salzburg should have a similar celebration dedicated to Mozart’s music. In 1877, Hans Richter, who had conducted at Bayreuth for the first festival there, brought the Vienna Philharmonic to Salzburg for three concerts of Mozart. Although these concerts were neither well received nor financially successful, it established the link between performances of Mozart and Salzburg. This, as we shall see, turned out to be very important. In that same year, 1877, Professor Karl Demel proposed building a concert hall on the Mönchsberg where Mozart’s operas would be staged. Again, this was to be similar to the Festspielhaus in Bayreuth. Architectural plans were made, but politicians and business leaders from Salzburg and Vienna were not very interested in the project. Demel finally abandoned his idea in 1891. At the turn of the 20th century, interest in creating a festival started again. In 1903, Max Reinhardt and Hermann Baur wanted to establish Salzburg as one of the musical centers of Europe, and in 1905, they suggested that a theater and opera festival be formed in Salzburg. Reinhardt was a successful and influential theatrical director and manager who was known for introducing new ideas into German theater. Although they could not raise the money for either project, the idea for a festival in Salzburg was planted in Reinhardt’s head. Another attempt to start a festival that did not succeed was in 1906. Lilli Lehmann, a great soprano from Berlin who had been active in raising the funds to build the Mozarteum, staged a Mozart festival in Salzburg with the Vienna Philharmonic. The three Da Ponte operas were staged and featured Gustav Mahler and Richard Strauss as conductors. Even the strength of these performances was not enough to build momentum to start a festival. Music for a “Rich and Elegant Public” or for Beer Drinkers? The next suggestion for a festival theater came in 1913 when Friedrich Gehmacher and Heinrich Damisch, two amateur music lovers, suggested that idea to the Mozarteum. Gehmacher was skilled in fund raising, and saw the financial benefit for the city. He said, “I think if is superfluous to point out what enormous economic effect the Salzburg Festival would have,” and that it would bring “a rich and elegant public” to Salzburg. This new festival hall was to be located near Maria Plain, a magnificent Baroque church that overlooks Salzburg from the north. Still, some people did not like this idea, and even the leaders of the Mozarteum were opposed to such a refined festival because they thought that some of their supporters were simple “Biertischgrossen” (overweight beer drinkers). Gehmacher and Damisch finally took matters into their own hands and established the Salzburg Festival Hall Society in Vienna with a parallel organization in Salzburg. But by this time, 1917, the price of the land near Maria Plain had increased and beyond what the new society could afford. 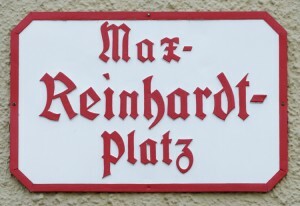 In Part 2 of this series, we will learn about Max Reinhardt, along with his friends Hugo von Hofmannsthal and Richard Strauss, were successful in getting the Salzburg Festival started. When we attend a concert these days, it is likely that we will hear the music of composers who died anywhere between 50 and 250 years ago. Composers who are still alive—people like John Adams, Steve Reich, or Arvo Pärt—are less known, even though their music is wonderful. But what about a musician who is Russia’s best-known living composer? Here is his fascinating story. Rodion Shchedrin at the piano. Rodion Shchedrin is now 80 years old, the son of a composer and music teacher in Moscow. Shchedrin’s talent was obvious at an early age, and he studied at the Moscow Choral School and the Moscow Conservatory graduating with honors when he was 23. Although he was a virtuoso pianist, he realized that he wanted to compose music as a career. In his late 20’s, one of his first pieces to get notoriety was his ballet music to “The Little Humped-Back Horse”. But these performances were also important to Shchedrin as he met the ballet star Maya Plisetskaya who became his wife shortly afterwards. They have been married for more than 50 years. Shchedrin’s work with the ballet led him to compose one of his best-known works. He was asked to compose new music to the Carmen story. (Actually Shostakovich and Khachaturian has been asked first, but both turned down the request!) Although this was to be different music than Bizet’s famous opera, Shchedrin found it impossible to think of the story without recalling these well-known themes. After much struggle, Shchedrin realized that the best solution was to take Bizet’s famous music and “recast” it for strings and percussion in a new and innovative way. The melodies that we know are still there, but the “packaging” is quite different and imaginative. One description says that “all the familiar tunes dressed up in a way Bizet would never have imagined, and with a sly grin and a twinkle in the eye.” Mstislav Rostropovich says Shchedrin’s “ingenuous sensation of orchestral color has manifested itself… in the immensely popular… Carmen Suite”. Shchedrin’s career has had several milestones. He received some of the highest awards offered by his government, including the USSR State Prize (1972), the Lenin Award (1984), and the State Prize of the Russian Federation (1992) which was given to him by Boris Yeltsin. For more than ten years, he was chairman of the Composers’ Association of the Russian Federation, succeeding Dmitri Shostakovich. It was Shostakovich’s wish that Shchedrin take this position. 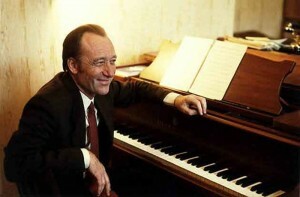 Although much of Shchedrin’s music was supported by the rather close-minded Soviet government, he was not opposed to taking a strong political stance. In 1968, Shchedrin was asked to sign a letter in support of the invasion of the former Czechoslovakia. He refused. Shchedrin has had an ongoing relationship with one of American’s finest orchestras, the New York Philharmonic. For part of their 125th Anniversary in 1967-68, the orchestra commissioned Shchedrin for a new work, and the composer wrote “The Chimes”. Leonard Bernstein conducted the premiere. A version of this article first appeared in Greensboro, North Carolina’s “News and Record” on January 13, 2013. Perhaps the most famous annual concert worldwide is the New Year’s Day Concert. This performance of the Philharmonic featuring the music of the Strauss family is now broadcast around the world and has come to represent Vienna to an international television audience. The first time Johann Strauss, Jr. directed the Philharmonic was on April 22, 1873 for the Vienna Opera Ball. 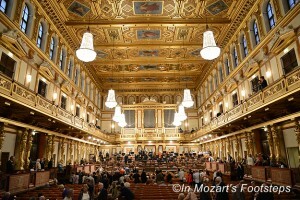 At that time, it was held in the Musikverein. Strauss wrote “Wiener Blut” for the occasion. The waltz master only conducted the orchestra a few times, the last of which turned out to be tragic. He guest conducted the Overture to Die Fledermaus at the Court Opera on May 22, 1899, and caught a cold which turned into pneumonia that killed him less than two weeks later. For all its popularity today, Strauss’ music was rarely played in the beginning of the 20th century. Things began to change in 1921, when Arthur Nikisch performed three waltzes with the orchestra to coincide with dedication of the Johann Strauss, Jr. statue in Stadtpark. Then in 1925, to celebrate the hundredth anniversary of Strauss’ birth, Felix Weingartner conducted “An der schönen blauen Donau” at two subscription concerts and also led an all-Strauss concert. From 1929 to 1933, Clemens Krauss led an annual series of concerts of music by the Strauss family. In what has become the New Year’s Day Concert, Krauss led “Special Concert” on December 31, 1939. Two years later, the concert was moved to January 1, with a repeat performance the following day. Finally, the name “New Year’s Concert” was used in 1946, and, except for two years, Krauss led these performances until his death in 1954. After much debate and discussion, the orchestra chose Willi Boskovsky to take over these concerts. Boskovsky led the New Year’s Day concerts for 25 years. For many, these were the golden years of these concerts. Boskovsky was the concertmaster of the Philharmonic and directed the orchestra just as Strauss himself had done – with violin in hand. He also had a charming personality that helped shape these concerts to become brief excursions into Vienna’s nostalgic past. It was during his tenure that the concert began being broadcast live on television, turning the once local concert into a worldwide media event. Following Boskovsky’s reign, Lorin Maazel was chosen to lead the concerts, which he did through 1986. From 1987, and continuing to the present day, a different renowned conductor is invited to conduct each year. The Strauss statue is the most photographed statue in Vienna.